Get your motor running! Check out the Slots Angels Game that has over 5 different special features including a Biker Race Bonus Round and a Progressive Jackpot. Motorcycle lovers will surely enjoy the 3D graphics with bikers on Harleys. Play the Slots Angels Game with a whopping 30 paylines. With plenty of bonus features and a Double Up Round, you’re sure to have fun playing this online slot machine powered by the BetSoft software platform. This game provides plenty of opportunities to win payouts, earn Free Spins, and gain Multipliers. For every winning combination, the center wheel respins giving you an additional chance to win. 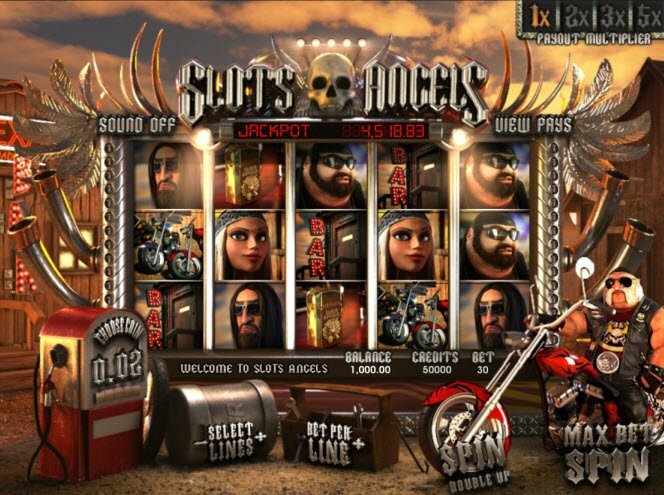 Motorcycle enthusiasts will love the Slots Angels software. Join this biker gang of rough and tumble guys at the local dive. Powered by the Betsoft software platform, the incredibly realistic 3D graphics will have you hanging out with the road dogs spinning the reels, playing darts, and flipping coins. The graphics come to life during winning combinations. 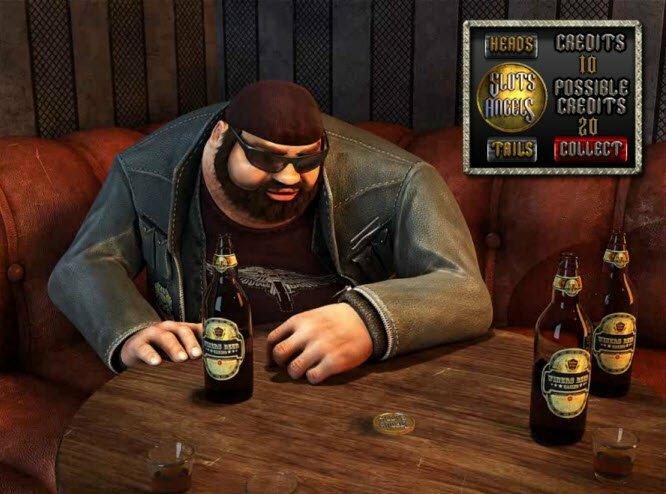 The game developers even created their own rendition of the song, “Bad to the Bone” with a version about playing slots. On top of all this, the Slots Angels Game features a Progressive Jackpot. Win the jackpot by getting 5X of the symbols on payline 1 while betting max. You could get rich instantly! The Slots Angels Bonuses has a formidable number of special game features. For example, each time you land on a winning combination, the prize money will pay out and the center reel respins for an instant chance to earn more wins. What’s even better?! Each time the reel respins, the multiplier in the upper right corner will increase up to 5X! During the Party Free Spins Mode, receive 3 or more bottles anywhere on the reels to trigger the Party Free Spins Mode. 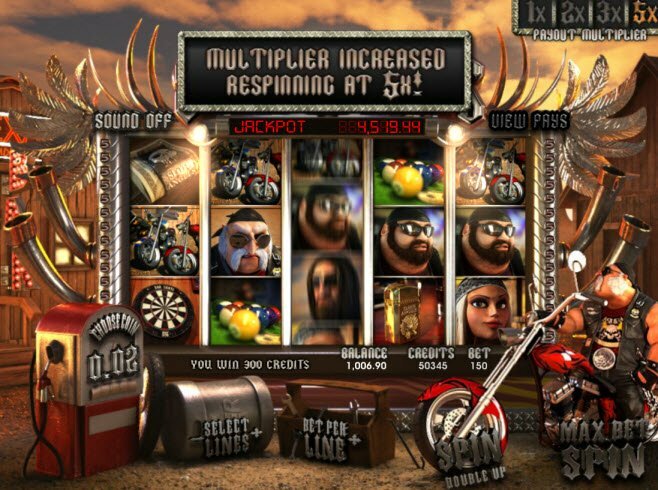 During Free Spins, the center reel turns wild and the biker gang enters the screen to cheer you on! 3 or more Dart symbols anywhere on the reels triggers The Darts Click Me Feature. During this feature, choose one of the three dart boards to see what kind of win you will receive. During the Double Up Coin Toss, you can double up your winnings after a spin and any respin that follows. Choose whether the big bikers coin will come out Heads or Tails. If you guess correctly your winnings will double! If you guess incorrectly, you lose your winnings. Get three or more Lead Biker icons and you will enter the Biker Race Bonus Round. During the bonus round, you choose who of the 3 bikers you think will win the race. You win credits based on where your biker places in the race.